Reader Find: Small Rare-Earth Magnets What’s your favorite tool? Tool Tech: Square Drill Bits? Our friend Joe Brown over at PopSci sent us this bit of tool tech (from Digg) today — it’s the math behind square drill bits. No, we’re not joking; there really are rotating drill bits that’ll drill square holes. These bits are based on known as a Reuleaux Triangle — a triangle that looks like it’s been inflated to 10 psi and is shaped sort of like a guitar pick. There’s lots of math involved, but essentially this shape can rotate within a square of the same width, though its center must follow a circular path in order to do so. Early last century, Harry Watts created a patented system for drilling shaped holes by adding a gearbox in the drill’s chuck to allow his special bits to simultaneously rotate and revolve. By changing the number of flutes on the drill and the shape of the gearbox, he created bits for drilling numerous shaped polygons. Toolmonger’s TV Tonight contributor Nick Carter wrote a great story for Make describing 14 ways to make square holes in aluminum sheet metal. We made square holes as part of our How-To: Add Rear Exit Handles to Your Truck post a while back. One of Nick’s methods involves filing, and this (among other reasons) is why you should have a good set of files. 6 Responses to Tool Tech: Square Drill Bits? I have a set of the Watts drills and have been meaning to work up a page showing them…when I get around to it I’ll drop a line. The drills are very cool. The rotary broaches are different than the watts drills in function. Watts drills are true drills where the rotary broaches are, well, more broachlike. even know why I need them but I do. 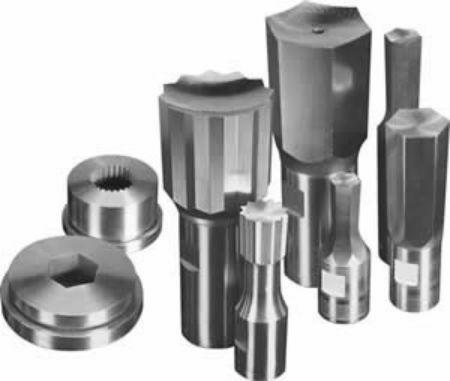 Yes, rotary broaching is different than the rotating drill bits. The rotary broach tool holder positions the broach at a one degree angle to the part. The broach rotates with the part, but because it is at an angle, it cuts the part one corner at a time. Rotary broaches will cut squares, hexes and more. The best way to visualize it is to watch the video at slatertools.com. See more users of Rotary Broaching tools at the Rotary Broaching Showcase: http://www.rotarybroaching.com. You can also order these tools online from Polygon Solutions at http://www.buybroaches.com They have an amazing rotary broach tool holder with a superior bearing pack and pressure relief vent hole.